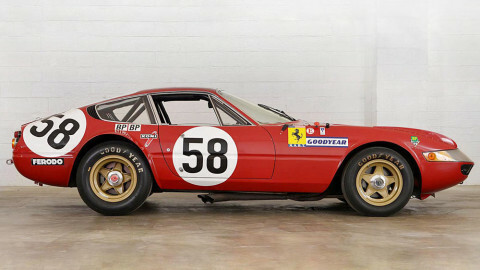 The 1969 Ferrari 365 GTB/4 Daytona Competizione raced by N.A.R.T. to fifth place overall at Le Mans in 1971 will go on sale at the Artcurial Le Mans 2018 sale. The estimate is $8 to $9.3 million. Artcurial will offer a rare 1969 Ferrari 365 GTB/4 Daytona Group IV Competizione conversion at in Artcurial Motorcars’ biennial sale at Le Mans Classic on 7 July 2018. This Daytona was raced by N.A.R.T. 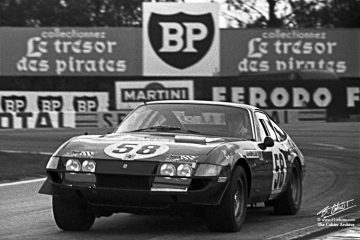 to 5th overall at Le Mans in 1971. Only 15 Competizione conversions of the 365 GTB/4 were ever built by Ferrari for client racings teams. The Daytona Competizione comes with a whopping estimate of €6.5 to 7.5 million ($8 – 9.3 million). The 1969 Ferrari 365 GTB/4 Daytona Competizione Group IV, chassis #12467, estimate €6,500,000 – €7,500,000, was one of three development prototypes that benefitted from modifications made to allow homologation for competition. It was one of the first client competition examples built by Ferrari and has a full alloy body. In all, only three series of five cars each were produced. 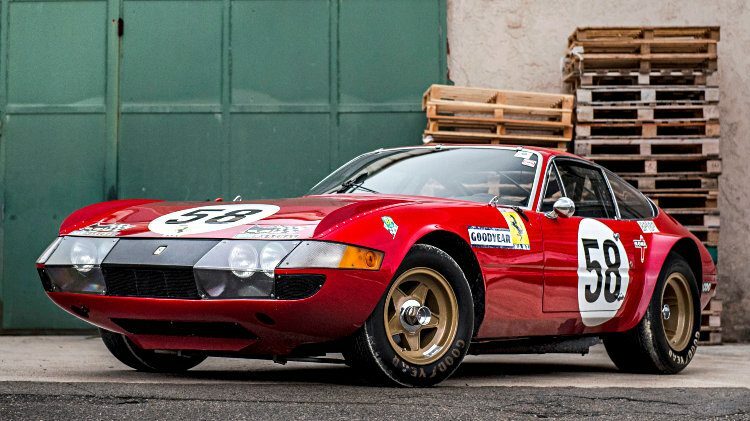 The Ferrari 365 GTB/4 Daytona was sold by the factory directly to Luigi Chinetti in April 1971, ready for the Le Mans 24 Hour Race in June of that year. Driven by Luigi “Coco” Chinetti Jnr and Bob Grossman for N.A.R.T, the Daytona finished 5th overall and won the 1971 Energy Index. Between 1971 and 1973, the car competed in major events in the US (including the Sebring 12 Hours, Daytona 6 Hours, Watkins Glen and Road Atlanta). With great racing provenance, this powerful Daytona Gr IV, #12467, one of only 15 competition versions built by the factory, is valued by Artcurial at €6.5 – 7.5 million ($8 – 9.3 million). Artcurial habitually aim high with noteworthy cars. The Artcurial sale will take place on 7 July 2018 at the Le Mans Circuit at Sarthe, France. According to Barchetta, the 1969 Ferrari 365 GTB/4 Daytona Competizione Group IV, chassis #12467, had at least ten different owners through the years. It was offered at two public auctions in recent years. The 1969 Ferrari 365 GTB/4 Daytona Competizione was offered at the Gooding Pebble Beach 2014 sale with an estimate of $5,500,000 to $7,000,000 but failed to sell with a highest bid of $3.5 million. A year later, it was offered in the Keno Brothers Rolling Sculpture auction in New York. The estimate was lowered to $4,900,000 to $5,900,000 but failed to sell despite a highest bid of $4.8 million. This will be Artcurial’s second Le Mans racing Ferrari on offer this year. The 1963 Ferrari 275 P that won the 1964 race was to have been offered at the Rétromobile sale but shortly before the auction had to be withdrawn due to legal issues related to the estate of Pierre Bardinon.